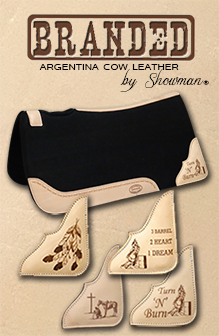 Showman® Argentina Cow Leather 3 Piece Headstall and breast collar set with navajo beaded inlay. This set features dark oil leather with teal, white, black, and gold navajo beaded inlay. Leather is double stitched and smooth and has brushed nickle conchos on headstall. Set includes browband headstall, breastcollar and matching wither strap.